It begins with an echoing trumpet tone, a handful of harmonics from a Fender Jazzmaster, a shimmer of cymbal, and a scrape of a bass string… Blood Quartet are here. 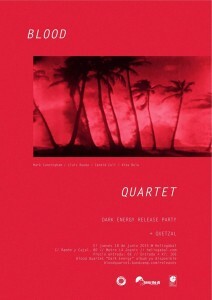 It was their first gig proper and the launch of the debut album, “Dark Energy” and Heliogàbal in Gràcia was packed out. On other days, Rueda, Bela and Coll are well-known Bcn noisesters, Murnau B, and New York ‘No Waver’ Cunningham has long been a resident experimentalist in Barcelona. This is, as far as I know, their first collaboration. What can I tell you? It works. Awesomely well. Slow tempos, heavy riffs, splashes of distorted noise, delicate without sacrificing intensity, it was swirlingly hypnotic and… loud. Having listened a few times to the album, it was all familiar in theme and spirit but the presentation was a little looser, edgier, the pieces were assembled in slightly different fashion, with room to go with the flow of adrenaline and push at the rehearsed structures. In other words, same foundations but a subtly different construction. Rueda’s guitar was all about noise and texture – open strings, drones, lots of effects pedals, drumstick as slide, beautifully atmospheric and aggressive. Bela’s bass was technically complex, steady and deep, providing much of the clockwork that enabled everyone else to step out. Including Coll whose drumming was insistent and fascinatingly arrhythmic, splashing hits here and there like a Jackson Pollack of percussion. Cunningham delighted me at one point simply by picking up a vintage Danelectro hollow body and hammering out cloth-muted riffs with the strings detuned to the point of sounding like amplified rubber bands. Oh, the trumpet? Well, his trumpet was exquisite, a tone that seemed to combine 70s electric Miles Davis with the soundtrack from Kubrick’s 2001, although what Cunningham actually did with that tone seemed to be entirely his own invention. If you find noise rock and experimental improvisation too formless, then you’ll enjoy the rhythmic anchor that gives a semblance of structure however far out Blood Quartet go. If you find jazz too abstract and ‘noodle-y’ then you’ll appreciate the jigsaw-like precision with which all the parts fit together. But if you enjoy experimental noisemaking and ‘out there’ rules-free jazz, you’ll discover no end of freedom in the playing; especially live. Put simply, Blood Quartet seem to pull off a very tricky balancing act with no apparent effort: it’s foot-tapping, beard-stroking, and head-shaking all at the same time. “Dark Energy” is available now from Bandcamp, name your price, and you can find Blood Quartet on Facebook.